All is going well with the Cashsilk top. I had knit about two inches more than you see here, but I realised I had miscalculated for the darts at the waist so I ripped it out. I started reknitting them but I was too tired to continue yesterday evening. Yesterday was a crazy day. I have finally made a decision about the capped sleeves. Sewing is evil. Why not pick up the stitches for the sleeve around the armhole, do some short rows to shape over the shoulder but prevent a bulk of material from gathering under the arm, then do a small band of seed stitch. The advantage of this method over a sleeve that you sew on is that I will be able to try it on as I knit the short rows, and if I make a balls of it I won’t have to spend the rest of my youth unpicking seams. Commuter knitting is sneaky. I thought I was never going to finish this other Jaywalker until I measured it this morning and lo! It was ready for some toe shaping. Since I am now wearing the socks, you may safely assume that I stopped to finish off the toe between taking the picture and writing this entry! As for the book, I spied it in Hodges Figgis yesterday. Actually I spied it about two weeks ago. I like the Hodges Figgis knitting section because their turn-over is quite good. Since the appearance of the Vintage Socks and other books such as Loop-d-Loop and the Nicky Epstein ones, I am convinced there is a knitter on the staff there. I bought Vintage Socks for a few reasons. There are a few chapters at the beginning of the book – nothing too taxing – about how she gathered resources for the book. The socks are mostly drawn from 19th-century designs she dug out from somewhere. I enjoy concise writing about the history of knitting so that was an immediate plus. There is a good mix of patterns also. I would say the balance between mens and womens socks is about 50-50, and I like the variety between textured and lace socks. I didn’t have a chance to read it thoroughly last night, but at a glance I think all the socks are cuff-down. There are at least four or five different types of heels and toes illustrated. 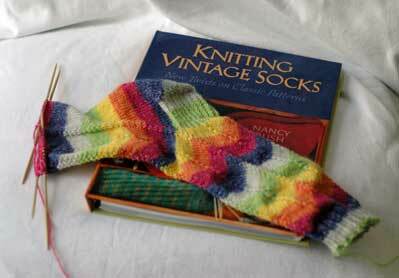 All in all, I think it will supplement my Cool Socks, Warm Feet book really well! I have discovered the joy that is chocolate milk. It’s an ingenious cheat. It’s very chocolatey… but it’s also milk, so it’s good for you! However the path to chocolate milk is lined with peril… the chocolate milk mustache. When I returned from the shop to see that mine had been inadequately licked away, it reminded me of how I occasionally used to wish for a mustache. No ordinary furry upper lip would do me… I craved one like this. Can you imagine how distracting that would be? I’d probably go so far as to grow one that would impair my vision. Anyway, I have come to the conclusion that I’m probably going to have to settle for a chocolate milk mustache if I want my life to stay relatively normal. It’s the time of year. I have been stewing away this weekend over impending finals in June. What better way to avoid facing exams than knitting? I finished the body of the Puff Sleeved Cardigan and… it is still too big. This is a mystery to me because I have been trying it on vigilantly as I was going along and it fitted fine. The minute I cast off, however, it saw its chance and grew by about two inches. The only explanation I have for this phenomenon is that I didn’t ‘reset’ the yarn after I unravelled the first attempt. This should mean (and don’t correct me if I’m wrong, I don’t want to know!) that it will shrink back into its original state when I wash it out. If this doesn’t happen, I’m throwing it in the tumble dryer until it fits me. Really, it doesn’t make sense because the one sleeve I’ve knit fits perfectly with just the right amount of puffiness. Needless to say, my zeal has finally worn thin. Thank God for Cashsilk. It will be a V-neck capped-sleeve top. 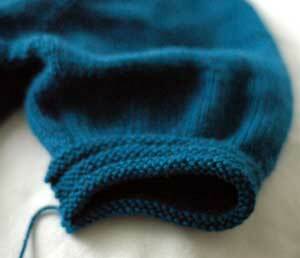 I must confess that I do not know how to construct a capped sleeve, but I have managed to come up with two options. 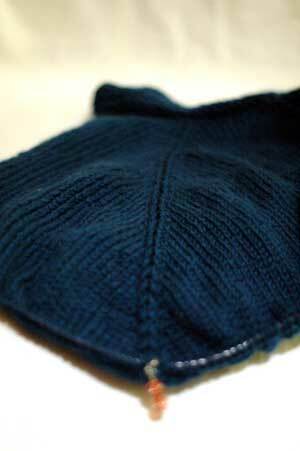 The first is to just knit a sleeveless top, then knit two triangles and sew them on. 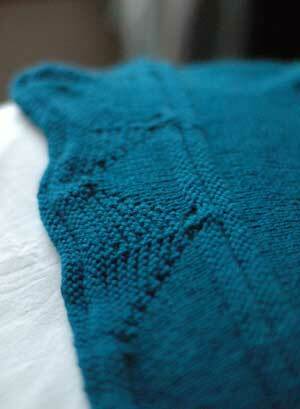 The second is to include the sleeve into the top as I’m knitting up – in other words to increase out over the arm. This option would need short rows to shape over the shoulder (unless you know someone who has arms that won’t stay down – a teacher that likes to point at the board, for example). I’m leaning towards option one because frankly, option two has the most potential for disaster, and option one gives you the choice of having a capped sleeve or just a sleeveless top. I had a complete crisis about this design before I got into bed last night. I have decided to put in darts instead of waist shaping at the side, which sounds like a good idea, but I started panicking about it. 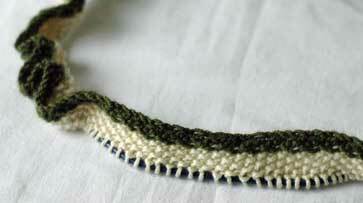 I think it’s the time of year – it’s just knitting for goodness sake! I’m going to try and hang on to the mustache until I get through the exams. Got a few skeins of Kidsilk Haze or Kidsilk Night sitting in your stash? Rosy only takes two balls and is available to download now! Buy it now here for €4. Paper copy available in the shop for €4.50. I went along to my first Knit Night at This is Knit this evening. It was great fun. I finished up in college around 540, had some tea and headed on out at my leisure. There was a nice turn out. We had tea and squashed fly biscuits* and there was much yak about wool, patterns and things in general. I didn’t take any photos because I didn’t have my camera with me, but Lisa took pictures. What a great way to get the drudgery knitting done! I have been slowly churning out the worst part of the Puff Sleeved Cardigan for the past two days now – the bit where you’re increasing for the sleeves. The last few rows are the worst because I had nearly to 370 stitches. I got there in the end, though. Tomorrow I have the wonderful job of putting those sleeves onto waste yarn and continuing on my merry way to the waist shaping. Once I got that done, I dug out my backup project. This is the Colinette Mohair I picked up in Galway a few weeks ago. Aren’t the colours just great? I thought it would make a lovely spring shawl, so I’m just doing a basic triangle shape with yarn-over increases up the middle. Knit on 10mm needles, this is a really quick knit, but I don’t give it much attention. I’ve been dipping in and out of my Jaywalker, too. 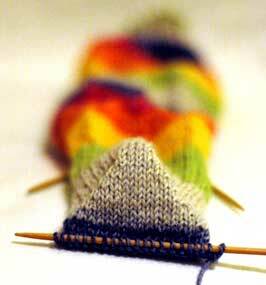 I keep this only for bus knitting and turned the heel on my way out to Blackrock this evening. The new Hipknits stuff came in just this week to the shop so I had a lot of fun admiring it – an aran weight hand-dyed silk, and sock-weight hand-dyed pure cashmere. Check them out here. I just may be tempted by the hand-dyed silk – great yardage for the price of it. There’s some other fun news, too, but it’s going to get a post of its own! *Shortcake biscuits with raisins in them. Don’t they look like squashed flies to you? Nothing like a hat to take the edge off. All I need to do is a crochet edging and maybe some i-cords for the ear-flaps. I still have about a third of my ball left over – pretty good going! 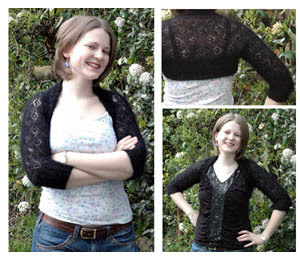 I got back to cranking out my Puff Sleeved Cardigan last night. 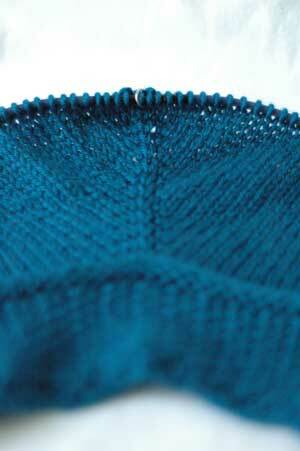 I didn’t get to spend very long at it but I got into the section for the sleeve increases. 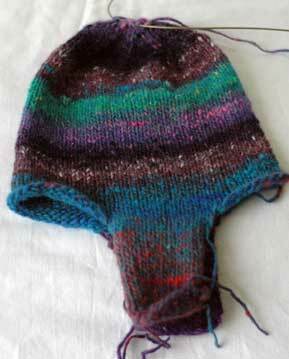 The good thing about this mindless back-and-forth knitting is that it gives me time to think about other things. Last night’s thinking was about the Cashsilk top. It’s going to be pretty simple so I want the construction to be good. 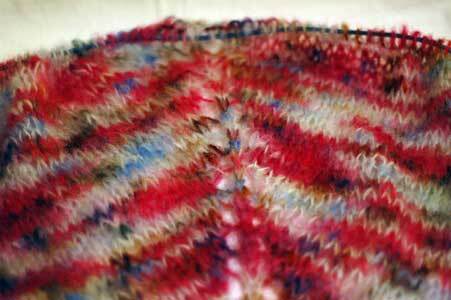 After a lot of mulling – usually on the purl rows because they go so slowly – I decided on a few things. 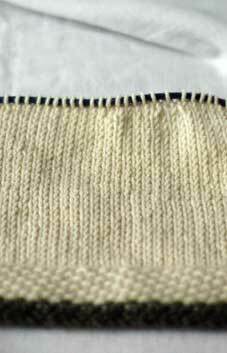 A seed stitch hem. Waist shaping via hip and bust darts. Simple crochet edging at the neckline and armholes. That should do it.